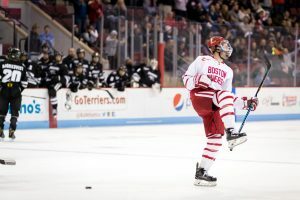 By now we are all sure you have heard the news circling around the Boston University men’s hockey team, The Boston Hockey Blog is happy to confirm that Eddie Moran will be joining Matt and Liam for this upcoming season. Below you can find more information about Eddie. We are working to learn more information about the rumors linking head coach David Quinn to the New York Rangers. Ed Moran is a rising senior in Boston University’s College of Communication double-majoring in Broadcast Journalism and Advertising. He grew up in the New York City area, but now resides in Windham, a rural town in upstate New York’s Catskill Mountains. Although Windham is far removed from New York’s sports culture, Ed has been entranced by sports since his childhood days of watching Sunday football with his grandfather. When he began applying for colleges in 2015, Ed focused on out-of-state schools with a strong communications background. He admittedly applied to BU on a whim, not fully aware of its academic, or even hockey, reputation. Little did Ed know when visiting BU on April 11, 2015, for COM’s Admitted Students Day, that he was there the day of the 2015 National Championship game between BU and Providence. 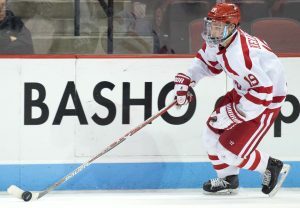 Seeing the BU students all along Commonwealth Avenue repping those scarlet and white colors exposed him to a sport he was previously unfamiliar with: hockey. Watching the mayhem that day convinced Ed all along, BU was the school for him. During freshman year, he joined FreeP as a writer for women’s soccer, basketball and lacrosse. Since then, he has served as an Associate Sports Editor, and is grateful to spend his senior year on the Hockey beat. Liam and I would like to personally apologize for the frustrations that you, our readers, had this year while attempting to access our blog. During the fall semester, while I was acting as the sports editor for The Daily Free Press, the website for the newspaper started experiencing issues which made it almost impossible to access the FreeP’s website. Due to the Boston Hockey Blog being an extension of the FreeP, our website also had issues. Being the sports editor, I sat in on meetings with the rest of the editorial board and we all shared the same frustrations about the website. Over the course of the season, both Liam and I know that a large amount of readers became frustrated with their inability to go onto our website and follow the team. Personally, I made it a point to reach out to every person who shared their frustration with us via a direct message either through Facebook or Twitter. During those interactions with the readers, I felt awful that people were could not follow the team the way they have done for years. If any regular readers of our blog lost faith in us due to the issues with the website and ultimately decided not to log onto our website anymore, both Liam and I feel truly awful. However, we would personally like to thank all the readers who stuck with us during our issues — those who were persistent in trying to log on even when they had the message “error establishing database connection.” You are all the reason we do this. You are all why both Liam and I love covering the team so much. Yes, we are both avid sports fans, but having such a loyal base of readers makes covering the Boston University men’s hockey team so extra special. Although there are only a few games left this season, Liam and I promise to cover the team the way you came to expect the blog to do so. If you have any questions, comments, or concerns please feel free to reach out to Matt at [email protected]. The Terriers managed a complete turnaround after dropping a pair of games to No. 6 Denver University last weekend. They topped No. 4 Quinnipiac 3-0 on Saturday, thanks to goals from Jordan Greenway, Bobo Carpenter and Jakob Forsbacka – Karlsson. 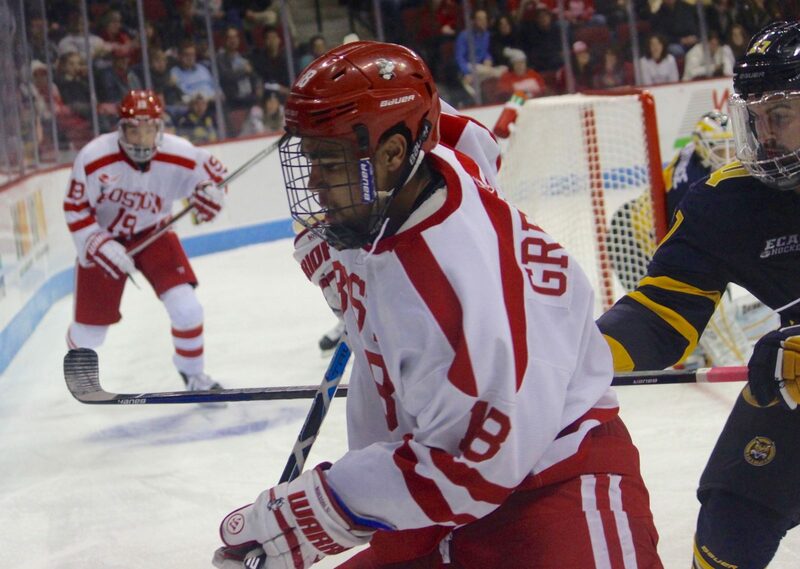 Nick’s sider on Jordan Greenway’s impressive weekend. Also check out our postgame videos if you missed them. The Terriers don’t have any games this upcoming weekend, but they will get back on the ice Friday, Nov. 4, when they take on Northeastern. Finally, keep an eye out for a feature from us this week! 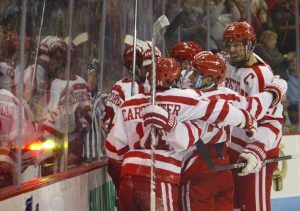 The NCAA announced early Sunday afternoon that the BU men’s hockey team will be traveling to St. Paul for regional competition, continuing a whirlwind season for the Terriers. We are hoping to join them to provide game coverage, as we have each game for many seasons now. As many of you know, The Daily Free Press is self-funded and does not accept funding from Boston University, in order to maintain its independence and neutrality. We each pay our hockey travel expenses out of pocket, a financial commitment we gladly embrace. Though we always arrange the most cost-effective accommodations, last-minute travel plans can pose a significant financial burden. We appreciate your loyalty all season and your support of independent student journalism. We are fueled by our readers, and have all grown as writers and reporters with the opportunity to produce content for you. We are absolutely thrilled for the opportunity to continue providing the best coverage of your favorite team throughout the remainder of the season. The 2015-16 Hockey Preview Issue is here! After several long weeks of reporting, interviewing, photographing and writing, our annual Hockey Preview Issue is here! You can check out all of our stories here. You can pick up a print copy at multiple locations across BU’s campus. If you aren’t near campus, you can see the PDF of the print edition here. Looking forward to hearing what you all have to say about this year’s issue! 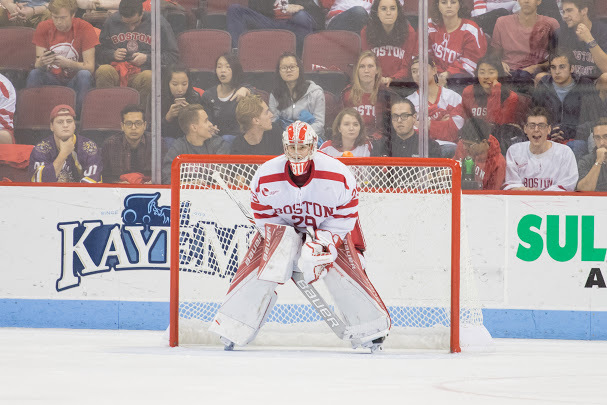 Due to the impending snowstorm set to hit the Boston area on Monday, the semifinal games of the Beanpot Tournament have been postponed and moved to Tuesday. The game times are still scheduled to be the same — Boston University and Harvard University will face off at TD Garden at 5 p.m., followed by the game between Northeastern University and Boston College. 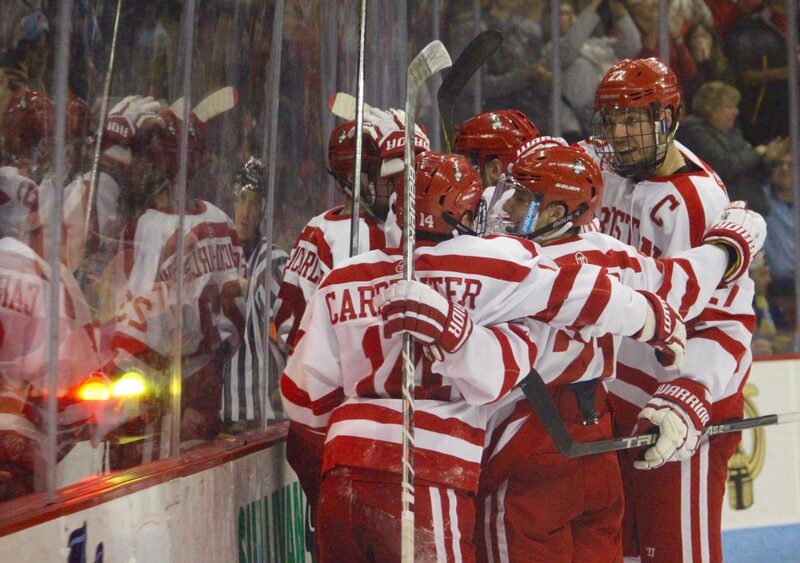 We’ll still have full coverage tomorrow and Tuesday as BU seeks its first Beanpot championship since 2009. Stay warm and safe, everyone! We’d like to wish all of you folks a very Happy Thanksgiving. The three of us are thankful for many things, including our readers who interact with us and read our content. Additionally, we are grateful for your patience throughout our transition this season to our new format — it’s taken some time to get used to it, but we’re pleased with how it’s turned out, and are happy to see people engaged and excited about the blog. We are grateful for the opportunity to cover BU, an experience that gives us the skills we need to be successful professional journalists. Here’s to a day of rest and delicious food, a peaceful holiday season and a continued exciting season for the Terriers. We’ve received quite a bit of feedback over the past several weeks about our transition to the new Boston Hockey Blog platform. We wanted to address some of your concerns in a somewhat more organized manner, so here’s a “State of the Boston Hockey Blog” address, if you will. Many have voiced concerns about the new commenting methods. We have now turned on the option to comment anonymously in the hopes that it will foster a livelier and more engaging discussion. We hope that conversation will remain respectful and productive, but you now have the option to voice your thoughts without revealing your identity if you feel more comfortable that way. In terms of the live blog, many of you have expressed concerns with the CoverItLive window cutting off when using it in a mobile or tablet format. One of our readers (thank you!) reached out with a solution, and we consulted with our online editor. We believe we have found a solution — essentially, it involves an option we didn’t realize need to be checked off while setting up the live blog, and a few other sizing options. This should solve orientation and spatial issues for future live blogs, but if it doesn’t, please let us know and we will work to fix it as quickly as possible. There are a few more nitty-gritty issues in terms of bugs that are plaguing the dailyfreepress.com domain as a whole — any time you get an error message, that has to do with an internal issue with the whole website. We believe it’s partially due to the number of users within the system, as we have a new process of posting stories. That’s also something we’re trying to solve with our web developer, and we’re hoping error messages become limited in the future. Errors on any website are inevitable, but we’ll do our best to limit the frequency. As we’ve mentioned before, this year has been a huge transition for the newspaper as a whole and also for this specific blog. In addition to being an entirely new beat, we are testing out a completely new platform and trying to make our content more online-oriented, as to correspond with the new ideology of The Daily Free Press as a whole. We know that change can be difficult, but we are determined to make sure all of the changes within the blog and its structure are positive. We appreciate your patience and loyalty throughout this process, and we hope you continue to be patient as we sort through our technical issues over the next little while. 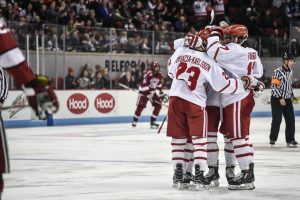 In an exciting year for the BU men’s hockey team, we will continue to try our hardest to bring you up-to-date and informative content about your favorite team. As always, if you have any questions, comments or concerns, don’t hesitate to reach out. Welcome to the new and improved Boston Hockey Blog. We hope to use this redesign as an opportunity to bring you an in-depth and interactive reading experience. Additionally, we’d like to introduce ourselves, since we’re an entirely new beat this year. The three of us all have editorial experience at the FreeP in addition to diverse backgrounds in sports coverage. Andrew Battifarano is a junior at BU working toward a dual degree in international relations and journalism. He was Sports Editor of the FreeP in Spring 2014, and has covered women’s hockey, softball, women’s basketball and men’s soccer for the paper. He has also interned for NESN. Sarah Kirkpatrick is also a junior at BU, studying journalism and gender studies. She was Editor-in-Chief of the FreeP in Spring 2014 and was Sports Editor the previous semester. She has primarily covered women’s hockey, cross country and track in her time at the FreeP, and has also interned for the sports department of seattlepi.com. 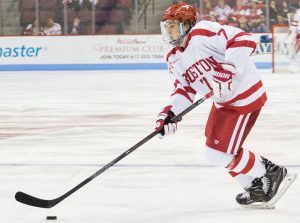 Conor Ryan is a senior at BU studying journalism. He is currently Sports Editor at the FreeP, and has covered women’s hockey, women’s basketball, women’s lacrosse and women’s soccer. He’s also interned for WEEI.com, and has experience covering the Bruins and Red Sox. We’re excited to get underway with our coverage this season. We’re always open to suggestions for improving our content and providing the best reading experience possible. 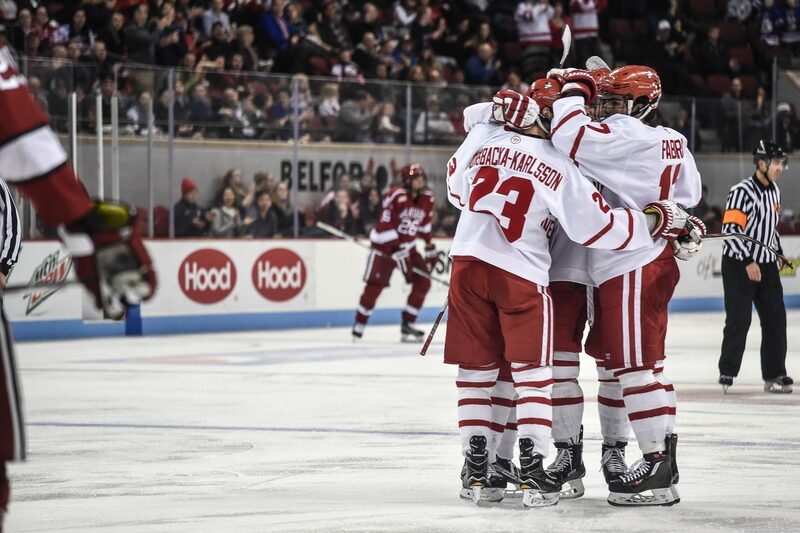 Let us know what you’d like to read about BU hockey this year by shooting us a tweet (@BOShockeyblog), email ([email protected]) or comment.